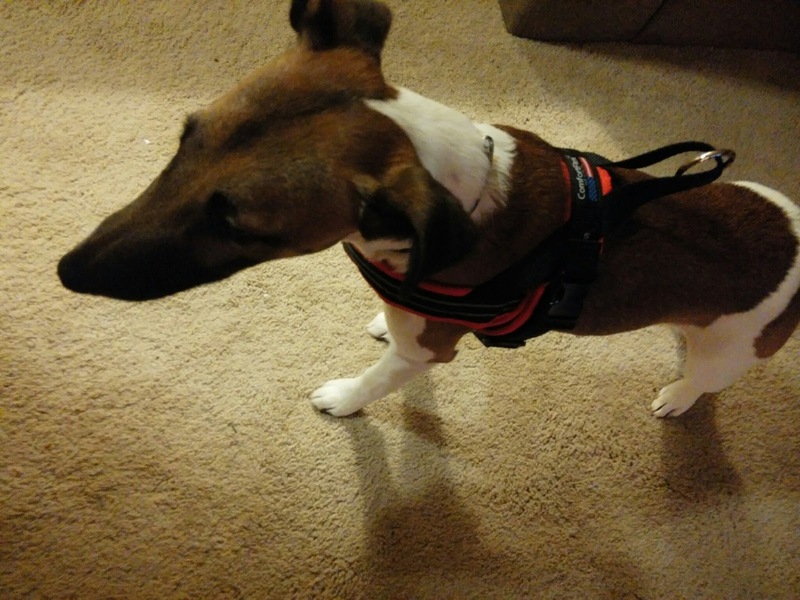 This Barking Wednesday I want to share with everyone a fantastic new harness I found. The ComfortFlex Sport Harness is Diesel's new harness. The ComfortFlex Sport Harness is made of sturdy padded nylon. 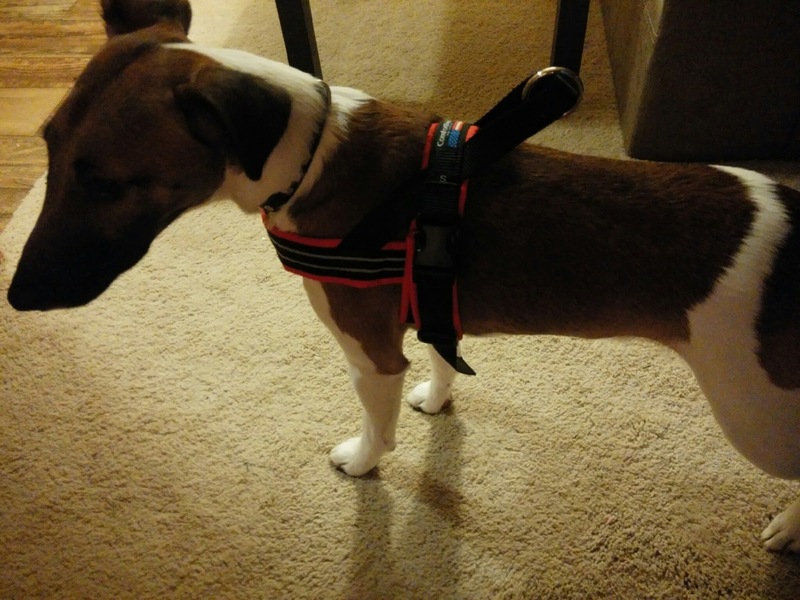 The harness is made to always direct pressure to your dogs chest. With the ComfortFlex design there is no underarm pressure which an cause irritation and chafing. Diesel is a Smooth Fox Terrier full of energy! Before the ComfortFlex getting a harness on Diesel was a task. 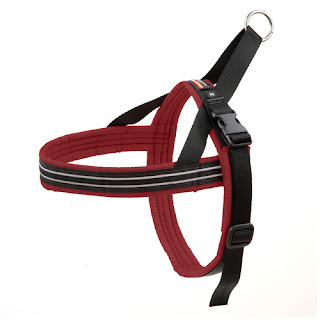 The ComfortFlex is made of sturdy padded nylon making getting the harness on very simple. No hassle ~ which makes getting ready for walks and potty breaks much easier for me. The sturdy construction seems to mold to Diesels form - giving Diesel a snug secure feeling. It is so much easier to control him while he is wearing the ComfortFlex. One more thing that is very nice is the reflective nylon used to make the ComfortFlex Sports Harness . I like the fact that while walking, Diesel can be seen. 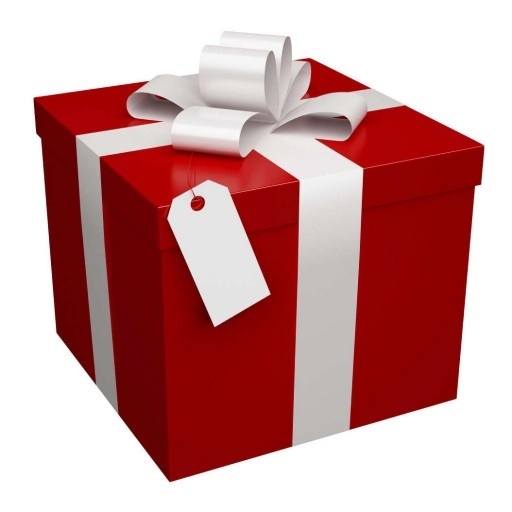 Sizing is so easy ~To find out which size is right for you pup measure their girth ~ sizing is based on girth length. Diesel is wearing a Small - it fits him perfectly. The ComfortFlex Sport Harness is a perfect holiday gift for the dog owner on your shopping list. We're so glad you and Diesel are enjoying the ComfortFlex Harness we sent you from our shop - http://www.GollyGear.com! It's a terrific choice for strong, little dogs!